If you wish to receive a full refund or an exchange, the garments must be returned in their original condition with the tags still intact. A garment that has been washed or used will not be replaced or refunded. Quality is defined by a superiority of its kind. Talk about your textbook definition. These Dickies Men's WP592 Relaxed Fit Cargo Pants define the word “quality” in more ways than one. Put the iron away, boys, these black pants are wrinkle-free. With permanent creases and pleated cargo pockets, you may have to find a new purpose for the ironing board. These men's pants are constructed with a wrinkle-resistant 65/35 polyester/cotton blend, which means that when you leave these Dickies on the floor, they won’t look like it. 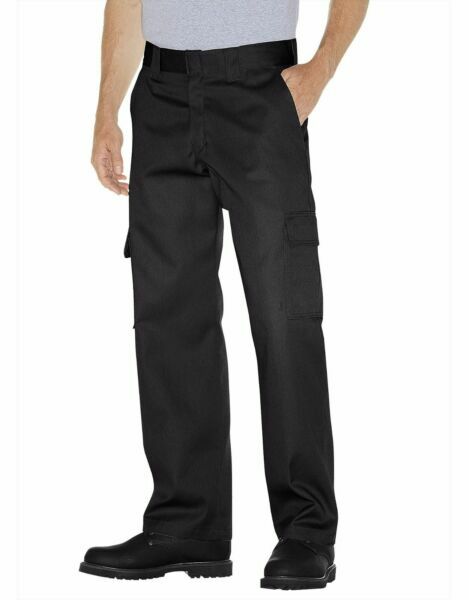 Breathable, durable, and comfortable, the relaxed straight fit of these cargo Pants ensure phenomenal fit and soothing feel, wear after laborious wear. The 8 ½-ounce Twill design delivers the toughness you've come to expect from the Dickies name. Along with stain-release treatment, they may actually look better than you after long days of the daily grind.